Christmas is coming, which gives me the opportunity to talk about one of my favourite shops of note, i.e. small independent shops here in Bielefeld. Ringelreif toyshop is located in the old town centre just off Obernstraße and is owned by husband and wife team Carlos and Christiane Mata. They have been running the shop for over 20 years. A huge attraction in the summer is an automated bear that blows bubbles above the shop door attracting children passing by. Henry squeals with delight every time we pass it. While he is chasing bubbles I have a chance to look at the lovingly presented window display; the emphasis is on traditional, good quality toys that Germany is famous for, i.e. HABA, Schleich and Kathe Kruse, as well as hand made wooden toys such as Fagus, who produce their toys in workshops for the disabled. Once inside, my two year old goes straight for the back of the shop to play with the toy train set from Brio whilst I have a good look round. The staff is always at hand if I need some advice. I have bought quirky stuffed toys here for babies, wooden puzzles and Djeco art sets for my sons and books and board games as presents for other children. They also have a good selection of games to play outdoors in the summer: toy planes, volleyballs and boomerangs, oh and I forgot to mention the dressing up clothes. They also sell real workbenches and tools for children. The enthusiasm of the staff rubs off on you, and I find myself returning again and again to this little shop. They may be traditional, but they keep up with trends. I discovered this on my last visit when I saw they had The Sylvanian Families in stock. For a small shop they really pack a lot in, and it definitely beats the numbing experience of toy megastores. p.s. In case you are wondering, this is a non-sponsored post! Christmas is one of my favourite times of the year, especially now we have kiddies. Coming from three different countries and living in a fourth we tell our sons the Weihnachtsman, Christkind and Father Christmas / Santa job share as they can’t each get around the world in one night… So depending on which country we spend Christmas in they know who’ll be bringing their presents. 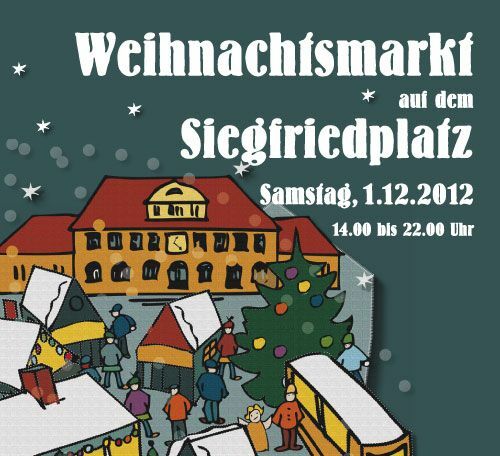 We are also looking forward to visiting some of the smaller christmas markets in and around Bielefeld. This Saturday we will be going to Siggies. There will also be a children’s theatre show in the Burgerwache at 3 pm and 4.15 pm- the fairy tale ‘the Golden Shooting Star’. Veranstalter: Rund um den Siggi e.V. in Kooperation mit der Bürgerinitiative Bürgerwache e.V. Let me know if you have other favourite weihnactsmarkts to reccomend! Should you want to have a taste of a Nordic Christmas, do join us for the Finnish Christmas Bazaar. The address and times are on the flyer. The easiest way to get there is to take the Strassen Bahn 3 to Babenhausen Sud, get off at the last stop and walk 5 min to the venue. We offer hand made crafts, some Finnish design, books, etc. There is a cafe with all home made goodies, including of course salmon soup. As part of a knitting workshop with our group, I spoke about guerrilla knitting – where artists graffiti or ‘yarn bomb’ with pieces of knitted art in public spaces. 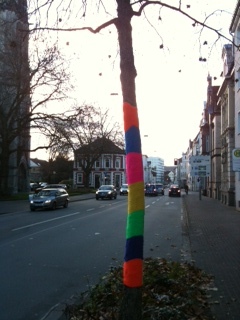 It’s a growing movement in cities all over the world so I was pleasantly surprised today to see an example here in Bielefeld. Let me know if anyone spots any more! Come join us this Thursday, November 22nd at Verve. 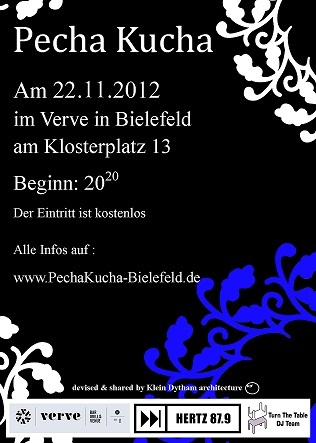 We have been invited to do a presentation about our Trailing Spouses art collective at this month’s Pecha Kucha event. Now what is Pecha Kucha I hear you ask! PechaKucha Night was devised in Tokyo in February 2003 as an event for young designers to meet, network, and show their work in public. It has turned into a massive celebration, with events happening in hundreds of cities around the world, inspiring creatives worldwide. Drawing its name from the Japanese term for the sound of “chit chat”, it rests on a presentation format that is based on a simple idea: 20 images x 20 seconds. It’s a format that makes presentations concise, and keeps things moving at a rapid pace. We will be delivering our presentation in both English and German – (10 seconds for each per slide!). There will also be other presentations which can cover just about any topic. 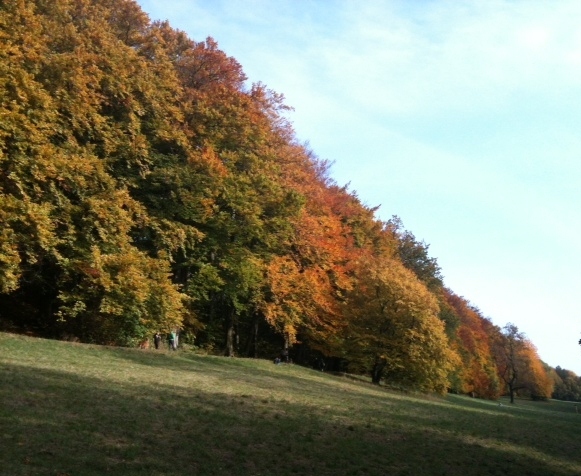 I first started this post in the autumn when the leaves were changing so this could be a suggestion for a winter walk, or save it for the spring. We were driving by the Japanese Garden in October and stopped to take a look. It’s a very pretty spot for some meditative peace and quiet. 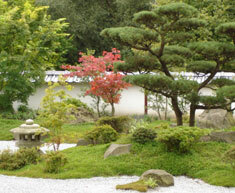 The idea is you can rest on the benches and admire the garden but you are not allowed to walk in it. However it is right next to a large hotel and it’s also tiny (I was expecting something a bit bigger). The location is beautiful though and you have nice views of the wooded hills from the garden behind the hotel pub where you can also get a drink. We then carried on to one of our favourite Sunday walks, along the Promenade (following the Hermannsweg) from the Sparrenburg Castle with good views of Bielefeld. Our first stop is the playground, after which look for a small path on the right going down with a sign to Freudental Restaurant. 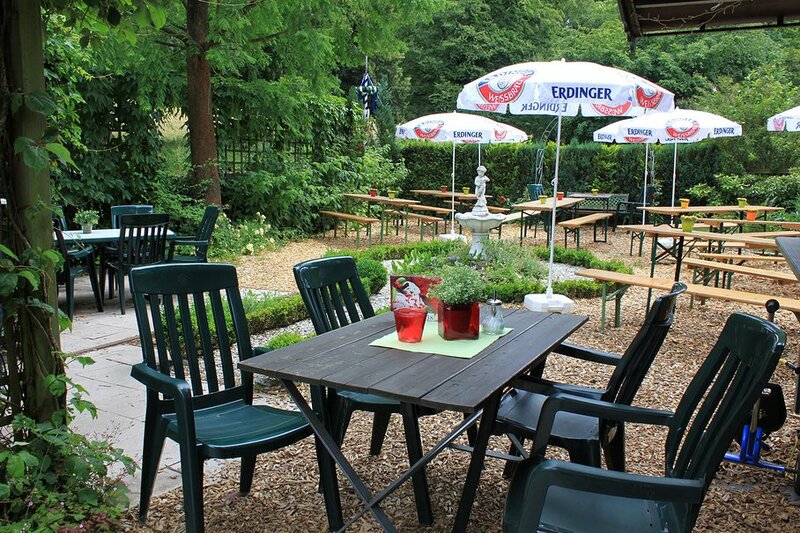 They have good cakes and a pretty biergarten in the summer, with bobby cars for the kids to ride on. There’s also a small playground right next door. This is also the start of the meadows – lots of open space with walking paths (where all the dogwalkers seem to end up) and a nice change from walking in the woods. One of the major milestones of living in a new country, especially one where you aren’t a native speaker of the language, is successfully getting a haircut. When I lived in Spain, I came home in tears and sporting a new mullet, so I know firsthand what a dangerous undertaking this can be. (At least this had nothing to do with my Spanish skills, and everything to do with the fact that Andalucians just love them some mullets). Both my husband and I have found that at hair salons in Bielefeld, the stylists are actually reluctant to cut away as much as you want them to. I had to insist at least three times that I really, really DID want it that short, even though it is getting cold here. At least there is little room for unfixable errors with this system of caution! 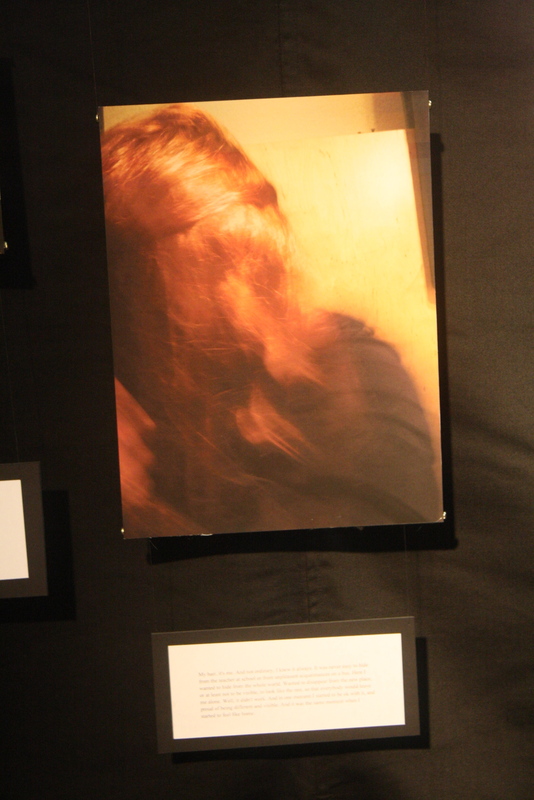 Your hair is a big part of who you are, as shown by a self-portrait from our recent TS art exhibition. Here are some recommended places that we pulled out in a recent e-mail conversation, as well as my own recent success story. Please feel free to add more in the comments below. Toni & Guy (from Rachel)- Located in the Altstadt, closest to the Rathaus stop. It’s not super cheap, as a cut and dry with Michael (senior stylist) is 50 euros, but they all speak English and do a good job. You can find more info about the chain here. Star Friseur 2 (from Patty) – It is a really cheap family-owned Turkish place at the Jahnplatz. They don’t speak much English, but I just bring a picture and they’re very nice about acting things out with their hands and trying to help. They don’t act irritated that we can’t speak German like some people do. Men are on the ground floor and women are upstairs. Both Billy and I have had good haircuts consistently there. Never had a color there, but watched another lady who did and it turned out very nice.